Team LISOT optis had a terrific six day clinic prior to Orange Bowl. Coaches Pepe and Fernando worked with about 10 sailors each day for the six days leading up to the regatta, including an afternoon practice on Christmas Day. Conditions were perfect every day - with wind 12-15 each day - and a solid 20 knots on two of the days. Daytime temps were cool early in the week - in the mid-60s, but rose nicely as Christmas approached, topping out above 80 on Christmas day. 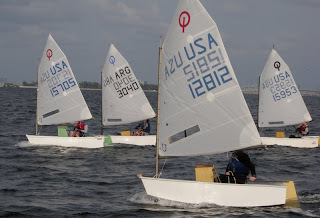 Teams from Switzerland and San Francisco joined for racing on a few afternoons, as well as two sailors from the UK on Christmas day. 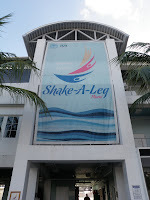 LISOT extends a big thank you to Shake-a-Leg for hosting the team for the week - which gave the kids a place to launch and store their boats, and pre and post practice debriefs.